Richard Neville, Earl of Warwick, called the king-maker, eldest son of Richard, Earl of Salisbury and Alice Montacute, was born November 22, 1428. The history of this mighty peer is that of the whole of the contest between the two houses of York and Lancaster. The house of Neville had been built up by a series of wealthy marriages, and Richard made no exception to the rule. While yet a boy he was married to Anne, daughter of the Earl of Warwick, and through her, after the death of her brother and niece, he took his place at the age of twenty-one among the chief earls of the English realm. By this time the English rule in France had broken down, bringing the reigning house of Lancaster into great unpopularity, and throwing a correspondingly greater influence into the hands of the leader of the opposition, Richard Plantagenet, Duke of York. He was brother-in-law to the Earl of Salisbury, and so attached to his party the powerful influence of the Nevilles. The Duke of York at first made no claim to the throne, demanding only that he should have his place in the councils of the king, and even when swords were drawn the Yorkists swore their allegiance to the king, Henry VI., while fighting against his advisers. Of these favorites of the king, the chief was the Earl of Somerset, whom many suspected of a design to establish himself as the successor to the throne. It was between these two factions of York and Somerset, that the white and red roses were first employed as distinguishing badges. 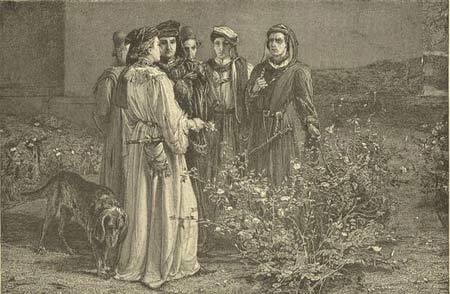 The Wars of the Roses began with the battle of St. Albans (1455), in which Somerset was killed. The victory was gained to the Yorkists chiefly by the help of Warwick. By a sudden sally into the streets of the town he routed the royal forces, and gained for himself that character of daring and courage which he maintained to the end. He was rewarded with the post of Captain of Calais, which he retained throughout the changes of the parties. In this position he was practically independent, and scoured the Channel at his pleasure. In 1458 he attacked some vessels which were under a treaty of peace with England, and being summoned to London to answer before the king, was violently attacked by the followers of Somerset and barely escaped with his life. In 1459 the civil war finally broke out. In the first campaign the Yorkists failed, owing to their inactivity. The leaders fled to the coast of Devon, where they hired five men to carry them to Bristol. As soon as they left land, Warwick, stripped to the doublet, took the helm, and steered straight for Calais, where he arrived in a few days. When Somerset, son of the earl slain at St. Albans, came to claim the keys of the stronghold, he had the mortification to find Warwick there before him. York and Lancaster-The White and Red Roses. Warwick was next in England on June 27, 1460, when he landed at Sandwich with fifteen hundred men. In four days he was before the walls of London, having marched in that time a distance of seventy miles. According to some accounts, the common people so flocked to his standard, that in those four days his force had swelled to forty thousand. The city threw open its gates and joyfully welcomed him, while Henry fled to the north. In the beginning of July the battle of Northampton was fought. The Yorkists gained a complete victory, and took Henry prisoner. Before the fight Warwick issued the command to spare the common people but to slay the nobles, judging the quarrel to be more especially theirs; and it is significant that throughout the Wars of the Roses the proportion of leaders slain far exceeds that in any other war. Up to this time Warwick's conception of the war was merely the natural struggle of the one party with the other for power, using as their means the rude arguments of the time. He still maintained his loyalty to King Henry, and when the Duke of York, after the battle of Northampton, presented his claim to the throne Warwick opposed him, and prevailed upon him to waive it till the death of the king. But naturally such a state of things could not long endure. Warwick, while respecting the person of the king, was fighting against his orders, and so, while professing loyalty, was actually a rebel. Soon the struggle blazed out anew, and in December, 1460, the Duke of York was defeated and slain at Wakefield. Early in 1461 Warwick was defeated in the second battle of St. Albans, but the royalists not taking advantage of their victory, Edward, son of the Duke of York, accompanied by Warwick, marched on London, and was proclaimed king as Edward IV. Soon after the Yorkists gained a complete victory at Towton (1461), the bloodiest field of the whole war. Nearly all the Lancastrian chiefs were slain, Henry's cause was lost, and ere long he was captured by Warwick and lodged in the Tower. The credit of the crowning victory of Towton does not rest with Warwick alone, for he had the help of young Edward, perhaps as great a military genius as himself. Little is known of the details of the fighting, but we are told that wherever the Earl of Warwick was, there the fight raged hottest. The earl was now the greatest man in England. His extended connections and immense possessions were joined to the most distinguished personal qualities, intrepidity, decision, and all the military virtues, eloquence and general talent, an affability and frankness of bearing that captivated equally all classes, a boundless hospitality and magnificence that enthroned him in the hearts of the commons. Wherever he resided, we are told he kept open house, and the number of people daily fed at his various mansions, when he was at the height of his prosperity, exceeded thirty thousand. "When he came to London," says Stowe in his "Chronicle," "he held such an house that six oxen were eaten at a breakfast, and every tavern was full of his meat; for who that had any acquaintance in that house he should have had as much sodden and roast as he might carry upon a long dagger." But now, when Warwick might have expected to reap the reward of his labors, new troubles arose. King Edward began to feel jealous of his power, his unique influence, and vast popularity. It is said that Warwick was sent to France to arrange a treaty with Louis, and to propose a marriage between Edward and his wife's sister. On his return he found the king married to Elizabeth Woodville, daughter of Lord Rivers, and an alliance made with the enemy of Louis, the Duke of Burgundy. Edward now lavished all his kindness on the Woodvilles, intending to use them as a counterfoil to the Nevilles, and for this purpose he deprived the Nevilles of some of their posts. By a series of deliberate insults Warwick was driven farther and farther away from the king, till he was forced into open revolt. In July, 1468, his forces defeated the royalists with great slaughter at Edgecote, and a few days later he made Edward his prisoner. The Lancastrians at once rose again in favor of the aged King Henry; but Warwick, maintaining his allegiance to his royal captive, suppressed all revolts with an iron hand, and, having received renewed pledges of good faith, soon after restored Edward to his throne. Two years later the king declared Warwick a rebel; and he was compelled to flee to France. Louis XI. used his influence in bringing Warwick and Margaret, wife of King Henry, together, and they agreed to forget their differences in the face of a common enemy. Clarence, the new king's brother, had previously married Warwick's daughter, and joined his party. Once more the king-maker landed in England and advanced on London. Edward fled to Holland and Henry was again placed upon the throne. 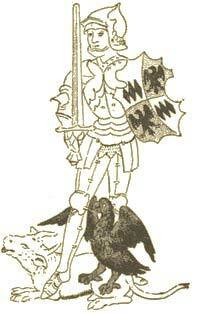 But ere long Edward secretly landed in England, raised an army, not without difficulty, and met Warwick at Barnet. The faithless Clarence had in the meantime deserted Warwick and joined his brother's army. The army of Warwick was composed of strangely different elements-old enemies fighting side by side as friends. The battle was lost mainly through a grievous blunder. In the heavy mist which hung around, the party of the Earl of Oxford were mistaken for the enemy and were attacked by their own friends. The cry of treachery was raised, and the whole army broke into utter rout. Warwick resisted till all hope was gone. He had fought on foot throughout the battle, and his heavy armor did not suffer him to escape. He was surrounded and slain, fighting manfully, April 14, 1471. Thus fell on the field of battle Richard, Earl of Warwick, in the prime of his life, after sixteen years of deep intrigue and desperate fighting. Had he been born in a more peaceful time he would have been a great statesman, and have done much for the good of his country, for his talents were more political than military, and almost alone among the self-seeking rivals of the time, he shows something of the instincts of patriotism. Cast as he was in the troublous times of the Wars of the Roses, he stands out in character and genius above all those of his generation. He was the best beloved man in the kingdom. When he was away from England, says Hall, the common people thought the sun had gone out of the heavens. His personality cast a charm over even Louis XI. The heart of the Yorkist party, he was true to its cause till he found that his service was no longer desired. He was not the man to sit quietly under insult, and when it came from King Edward, who owed all that he was to him, it was more than he could endure. Yet it was only when he found his every project thwarted, and especially those that were dearest to his heart, that he was driven into open warfare with the king. His treason is capable of much justification: he cannot be accused of forsaking his master. He had in him the making of a great king, and how great and useful might have been his career had fortune placed him over the councils of a Charles VII. or a Henry VI.! As it is, he stands in worth and character far above any of his time, a figure that commands not merely admiration but affection.